Gladys' Clam House was listed on an old Harlem Renaissance speakeasy map illustration and that had us wondering what the establishment was all about. 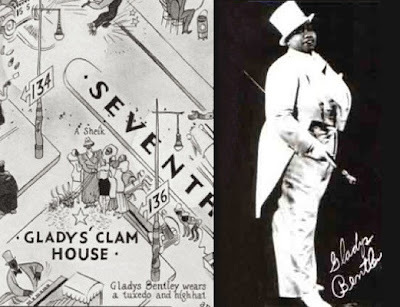 As noted, Gladys Bentley performed in tuxedos and was an excellent piano player but the speakeasy was actually called Harry Hansberry's Clam House which was located at 133rd Street. 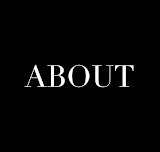 There's not much else on the once famous address except that it was located between Lenox and Seventh Avenue but apparently the club was the most notorious establishment uptown. Gladys Bentley's show in the 1920's included drag back up dancers and the Clam House was the most swinging gay uptown establishment during the Renaissance years. I came across lots of good material about Gladys Bentley in the course of researching my history of Harlem--most of which never made it into the final draft. Bentley was a lesbian who performed as a man at the Clam House, a mixed-race, after-hours club she owned at 146 West 133rd Street, in the middle of “Jungle Alley.” Bentley, born in 1907 to an American father and a Trinidadian mother, got her start uptown around 1923 by doing cross-dressing acts in a top hat and tuxedo. She played pianio and sang pop tunes as well as more risque material and soon had a large following uptown, especially among lesbians, with whom she would flirt onstage (She eventually had success as an Okeh recording artist starting in 1928 with “Worried Blues,” but her act was a novelty that soon wore off). She moved to Los Angeles in 1937 and after World War II stopped cross-dressing and married and divorced before joining the Temple of Love in Christ. She died from complications of the flu in 1960. Thank You Jonathan. BTW is that Jackie Mabley, Jackie "Moms" Mabley? My father & his family lived on both West 133rd & West 134th b/t Lenox & ACP Blvd in the 40's. My grandmother hated West 133rd St. because as she called it, it was "Open House all day and all nite." She also referred to 133rd Street as being "bad in the daytime!" Thank you Jonathon, as always. Wonderful to learn. And you, Greg. Your history and insights are terrific. Wish I had had the privilege of knowing your grandmother. Thanks Jonathan - you are invaluable as always. It appears the building was demolished in 1969 based on permits filed and a new townhouse construction currently sits on the site. We will try to get a photo of the original building for a future post. Sorry for the late response, but yes, that was "Moms" Mabley.